1. Using social media sites or a Google search as a background check: Browsing an applicant’s Facebook or MySpace page, or researching them through an internet search engine does not equal a background check. 2. Performing the background check yourself: Employers must ensure they are in compliance with the FCRA. The best, easiest way to accomplish this is by using the services of a reputable background screening company. 3. Burying the screening approval language in the application: You must provide a separate document to obtain the applicant’s approval for credit and background checks. 4. Failing to obtain the applicant’s signature: Applicant signatures must be obtained before you run any type of credit checks. 5. Improper disclosure when rejecting an applicant: If you reject an applicant because of poor credit history, provide them a copy of their credit report, along with the reason they will not be hired. 6. Failure to obtain permission from online applicants: You cannot simply state online that you will be performing a background screening and/or credit check—you must have an electronic approval from the applicant. 7. Inconsistency: You cannot require a background and credit check for some applicants, but not others. Inconsistent policy enforcement could lead to accusations of discrimination. 8. 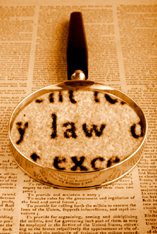 Believing that FCRA doesn’t apply: Even small employers are subject to the law. There is no distinction made between a one-person business and a huge corporation. 9. Not obtaining permission from current employees: If you decide to run credit checks on your employees after they were hired, you must disclose your intention and get their approval in writing. 10. Improper disposal of information: Employers must comply with the Fair and Accurate Credit Transactions Act of 2003 (FACTA), an amendment to the FCRA. This law requires proper disposal for information contained in or derived from a consumer report. That means no tossing reports in the trash can—they must be shredded or otherwise destroyed so they cannot be reconstructed. Digital information must be destroyed before a computer is sold or donated. The first question we had was, “Do you have a written drug policy?” Every company needs one that firmly states that yours is a drug-free workplace, and that workers suspected of being under the influence on the job are subject to testing. It should further state that, if they refuse to be tested, they can be fired. Often, a policy that is communicated well and enforced will be enough deterrent. But sometimes, employees have real problems and need help. Such was the case with our employer friend. He valued this person immensely—she had been a good and loyal employee, never a moment’s trouble. She was a great team player and everyone enjoyed working with her. He cared about her as a person—just as he did with all his staff. He wanted to approach the issue with sensitivity. “Should I do a drug test?” First, you want to confirm your suspicion. The symptoms he described could explain everything from a stomach flu to migraine headaches. She could be depressed, or dealing with stressful family issues. Accusations of drug use are serious, and should be dealt with carefully. It’s always wise to talk to a professional. Freelance HR consultants can be worth their weight in gold at a time like this. Or, consult a physician or drug counselor and run the employee’s list of symptoms by them. They’ve seen them all—typically, drug users’ behavior tends to run along classic lines. If your suspicions are confirmed, then make a plan for action. It should include treatment options, if the company’s insurance plan covers them. Then, approach the employee as a person concerned with her work performance and well-being—not as the boss who’s going to fire her. Simply and clearly communicate your observations regarding her work performance, without judgment or accusation—and ask if there is anything that you can do to help. Notify her that you have consulted with professionals, and be ready to present her options. If the employee values her job and is ready to address her problems, she will likely say so. If not, record notes about the conversation, and keep monitoring her work performance and on-the-job behavior. If it continues to decline, you have cause to take further action. Don’t forget to check out our Pre-Employment Screening services. Increase your peace of mind and save training costs by hiring smart! As we wait for our economy to come out of recession, smart employers will continue to find ways to invest in employees to keep their companies going strong. One way to do it is to keep working on your company culture—which we’ve discussed previously in this blog. An important thing to remember is that creating a strong company culture isn’t about spending money. It’s about bringing employees into a shared vision and purpose. How do you find the people who share your company’s vision and purpose? Look for a passion for what you’re doing. It can’t always be about the money—especially in this economy! Employees understand that companies are cutting expenses, perks, and benefits. Belief in what their employer is doing is more important to many young people today. Your company’s culture is based in the leadership from the top—so it’s up to you to give your employees what they’re looking for. These days, more employers are offering a relaxed work environment, flexible hours, and telecommuting. But every employer can provide the upbeat, vibrant surroundings, positive feedback, and learning opportunities that make employees want to stay and help the company achieve success. How do you get employees to buy into your leadership? Your employees want to learn and be challenged. Be transparent to help them learn everything about you and your company. Give them opportunities to stretch and grow. Invest in your employees by training them properly and giving them the tools they need to succeed at their jobs. Think about recruiting your employees even after they’ve been hired. Recruit their ideas, their input, their buy in, and their loyalty. And institute their suggestions for improvements–nothing makes employees happier than to see a suggestion acted upon. If you invest wisely in your people, they will want to support you and the company’s vision—because it’s their vision, too. A company culture of strong leadership doesn’t cost anything—and it leads to higher productivity, lower turnover, and greater customer satisfaction. 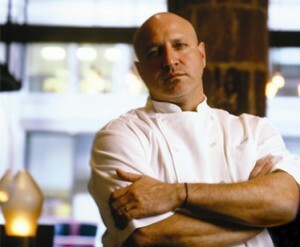 Tom Colicchio is a celebrity chef and host of TV’s popular reality show, Top Chef. He’s also a successful, multiple restaurant owner. Tom is not what you’d call Mr. Nice Guy on Top Chef; he’s tough, but fair. We imagine he’s like that in his restaurants, too. And as in all businesses large and small, the economy has given restaurant owners even more challenges. Maintaining high quality in product and service levels is always difficult, but when people are not spending as much on eating out, restaurants have to find ways to control and cut costs wherever they can. Tom offered some advice in a recent interview that applies to every business owner: instead of issuing new rules and orders to your employees, engage them in finding real solutions. Tom finds employees are more willing to help and work with you when the economy is down—after all, they’re afraid of losing their jobs, too. An example: in one of his restaurants, the monthly bill for replacing china and glassware is typically $3,000. Wow! That sounds like a lot of wasted pottery, glass, and money! Instead of just telling his staff to be more careful, Tom asked the question: Why are we breaking so many dishes and glasses? It turned out the dishwashing area (the dishpit) was stainless steel—not the most forgiving material for hurried bussers and dishwashers. So they created a new system, padding the area with rubber. The result? Dishes can now hit the floor or the counter without breaking. A simple, lasting solution to a very expensive problem. Every business owner has felt frustrated at the seemingly endless ways money gets sucked out of their bank account. And most employees have felt the wrath of their boss issuing loud orders to stop wasting supplies, making mistakes, and filling garbage cans instead of the cash register. There is a better way. If you need to cut expenses, don’t just issue orders and institute new rules; engage your staff to help find solutions that will prevent the problem in the first place. It’s not enough to say “We have a problem.” Ask “Why do we have this problem?” And ask it of everyone involved in the process you want to fix. Employers slashed 467,000 jobs in June, to bring the US unemployment rate closer to double-digit levels. The jobless rate is now 9.5%, up slightly from May’s 9.4% figure. Since the recession began in December, 2007, the number of jobless Americans has increased by 7.2 million; the unemployment rate has increased by 4.6%. Blacks, Hispanics, and teenagers have higher rates of unemployment than the general population, at 14.7 percent, 12.2 percent, and 24 percent, respectively. These numbers show little change from May’s figures. The number of long-term unemployed, who are classified as jobless for 27 weeks or more, increased by 433,000 in June, to 4.4 million. Construction and manufacturing jobs continue to take the biggest hit in the sliding U.S. economy. Manufacturing dropped over 136,000 workers, and construction employment declined by 79,000 in June—a smaller decline than the rest of the year. Since the start of the recession, manufacturing employment has decreased by 1.9 million, and construction by 1.3 million. The professional and business services sector lost 116,000 jobs, and federal government jobs were cut by 49,000 in June—mostly workers hired to prepare for the 2010 Census. Even temporary help services are on the decline: by 38,000 in June and 848,000 since the start of the recession. Automobile dealership closures affected June’s numbers: 9,000 jobs were lost in this category. And overall retail jobs declined by 21,000. Losses in retail jobs have leveled out over the past three months. Financial services continue to shed jobs: 27,000 in June, to bring the total lost in financial services to 489,000 since the recession’s beginning in December, 2007. The information industry lost 21,000 jobs in June, and is down by 187,000 since the recession began. Publishing has accounted for about half the total job losses in this category. The only real increase was seen in education and health care, which added 34,000 jobs in June. Health care job increases have averaged 21,000 per month, which is down from 2008’s average of 30,000 per month. A broader indicator of the state of unemployment is the number of Americans who have given up looking for a job, or who are working part-time when they want full-time work: this number rose to 16.5% in June. June’s unemployment figure tempered signs of progress in the US economy, and reiterate the fact that the job market remains weak—something 14.7 million Americans know only too well.